Kingwood, also known as “The Livable Forest”, is one of Houston’s Best Suburbs and located about 30 minutes northeast of The Bayou City. Kingwood, also known as “The Livable Forest”, is one of Houston’s Best Suburbs. The neighborhood features lush suburban atmosphere and great selection of homes. TOP RANKED SCHOOLS. According to the Best Houston Schools report, many of Kingwood schools are ranked amongst the top in the state of Texas. The list includes Bear Branch Elementary School, Willow Creek Elementary, and Shadow Forest Elementary School. 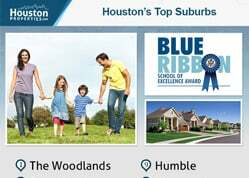 AFFORDABILITY: Kingwood is ranked as one of Houston’s Best Suburbs based upon community ratings for public schools, affordability, commute time, livability and amenities. MASTER PLANNED COMMUNITY: Spanning over 14,000 acres, Kingwood is the largest master-planned community in the Harris County. The neighborhood is made up of 25 villages and spans two counties, Harris and Montgomery. OUTDOOR ACTIVITIES: Kingwood features more than 500 acres of parks and green spaces, as well as more than 75 miles of multi-purpose trails and greenbelts. Residents enjoy easy access to outdoor activities like jogging, biking, and fishing. Kingwood is home to a large number of villages and communities; its real estate market can be tricky to navigate. Consulting with the best Kingwood realtor for suggestions and advice can greatly benefit homebuyers. For any inquiries about Kingwood homes recommendations, or off-market MLS listings, get in touch with Paige Martin, head of the Houston Properties Team and one of the best realtors in Houston. I am interested in Kingwood East and would like to get more details. Kingwood covers a sprawling 15,000-acre area about 28 miles north of downtown Houston. Kingwood homes enjoy a relatively central location. The master-planned community is located just off Eastex Freeway, and is minutes away from the airport. Main roads and freeways are easily accessible from the community, including FM 1960, Interstate 69, and Lake Houston Parkway. Kingwood features more than 500 acres of parks and green spaces, as well as more than 75 miles of multi-purpose trails and greenbelts. Kingwood homes are minutes away from restaurants, cafes, and stores. Deerbrook Mall, a large retail center, is a short drive away. Kingwood real estate is made up of a wide assortment of homes, from ranch-style and patio homes to lakefront manors and golf course estates. Kingwood ranks as one of Houston’s Best Suburbs, based from community ratings for public schools, affordability, commute time, livability and amenities. Established in 1971 and built out in the 2000s, the master-planned community is made up of 25 villages and spans two counties (Harris and Montgomery). Each village has a homeowners association, deed restrictions, and architectural guidelines. 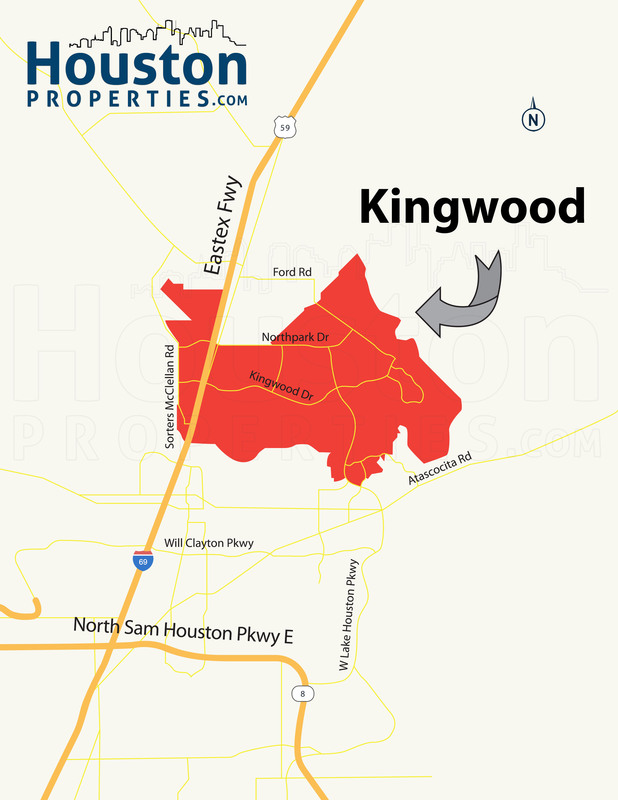 Kingwood was from a joint venture between Friendswood Development Company and King Ranch. Most Kingwood homes are zoned to the Humble ISD. New Caney ISD schools serve homes within Montgomery County. Kingwood real estate typically offer 2- to 4-bedroom floor plans, with 1,000 to more than 3,500 square feet of living space. Lot sizes can range from 3,000 to more than 10,000 square feet. Prices for Kingwood homes for sale can start at $150,000. Bigger and newer properties can sell for well over $1,000,000. Located some 23 miles northeast of downtown Houston, Kingwood is nestled in a verdant area north of Lake Houston. The 15,000-acre master-planned community is east of Spring and north of Atascocita and Humble. Main roads and thoroughfares like Interstate 69 (Eastex Freeway), FM 1960, and Lake Houston Parkway are easily accessible from Kingwood homes. Kingwood is divided into 25 distinct villages, each with its own homeowners association, architectural guidelines and restrictions. Dubbed as “The Livable Forest,” the community features more than 500 acres of parks and green spaces. Private nature preserves are scattered throughout Kingwood’s many neighborhoods. The master-planned community also features more than 75 miles of multi-purpose trails and greenbelts, as well as 2 golf courses. Though mostly residential, Kingwood does have several retail and entertainment hotspots. Residents also have plenty of options nearby. 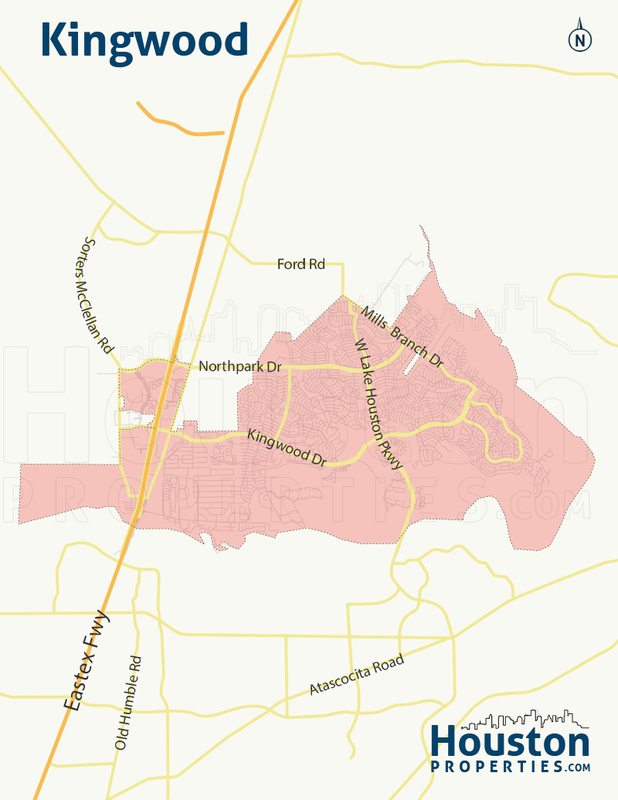 Kingwood is made up of 25 villages. Each village has its own homeowners associations and architectural guidelines. The HOAs typically handle landscaping, maintenance, and other community guidelines. Kingwood homes are zoned to Humble Independent School District, while others are served by schools from the New Caney Independent School District. Both districts have National Blue Ribbon Schools and schools with a 10/10 and 9/10 rating from GreatSchools.org. *Note: Due to the number of schools serving Kingwood homes, we opted to list the top ranked public schools. For a more detailed guide, check our Houston’s Best Schools guide. For specific recommendation, please email me at Paige@HoustonProperties.com. Bear Branch Elementary School at 3500 Garden Lake Dr.
Deerwood Elementary School at 2920 Forest Garden Dr.
Elm Grove Elementary School at 2815 Clear Ridge Dr.
Foster Elementary School at 1800 Trailwood Village Dr.
Greentree Elementary at 3502 Brookshadow Dr.
Oak Forest Elementary School at 6400 Kingwood Glen. Shadow Forest Elementary at 2300 Mills Branch Dr.
Willow Creek Elementary at 2002 Willow Terrace Dr.
Woodland Hills Elementary at 2222 Tree Ln. Kings Manor Elementary School at 21111 Royal Crossing Dr.
Creekwood Middle School at 3603 W Lake Houston Pkwy. Riverwood Middle School at 2910 High Valley Dr.
Woodridge Middle School at 4540 Woodridge Pkwy. Kingwood High School at 2701 Kingwood Dr. One of the Humble ISD’s multi-award winning schools, Kingwood High was named a National Blue Ribbon School in 1984. It has also been awarded the Lone Star Cup five times. Kingwood Park High School at 4015 Woodland Hills Dr. Kingwood Park High, also known as K-Park, was founded in 2007. Apart from its excellent academic programs, Kingwood Park’s boys’ swim team have won several state championships. Porter High School at 22625 Sandy Ln. Established in 2010, Porter High School is the second high school within the New Caney ISD. Quest Early College High School at 15903 W Lake Houston Pkwy. Students zoned to the Humble ISD may opt to attend Quest, an early college high school. Students can earn college credit and associate degrees through the school’s various academic programs. The following are some of the more notable private schools near Kingwood. St. Martha Catholic School at 4301 Woodridge Pkwy. Atascosita Montessori School at 19120 W Lake Houston Pkwy. Christian School Of Kingwood at 806 Russell Palmer Rd. Houston Learning Academy at 5334 FM 1960 Rd E.
Kingwood Christian Academy at 1365 Northpark Dr.
Kingwood Montessori at 2510 Mills Branch Dr.
Lake Houston Academy at 7810 FM 1960 Rd E Ste 104. To find an updated listing of all Kingwood real estate zoned to any specific public school, please send an email to Paige Martin at Paige@HoustonProperties.com with the property preference and budget that you’re working with. Kingwood real estate has remained popular over the years due to its lush environment, peaceful atmosphere, and wide choice of homes. 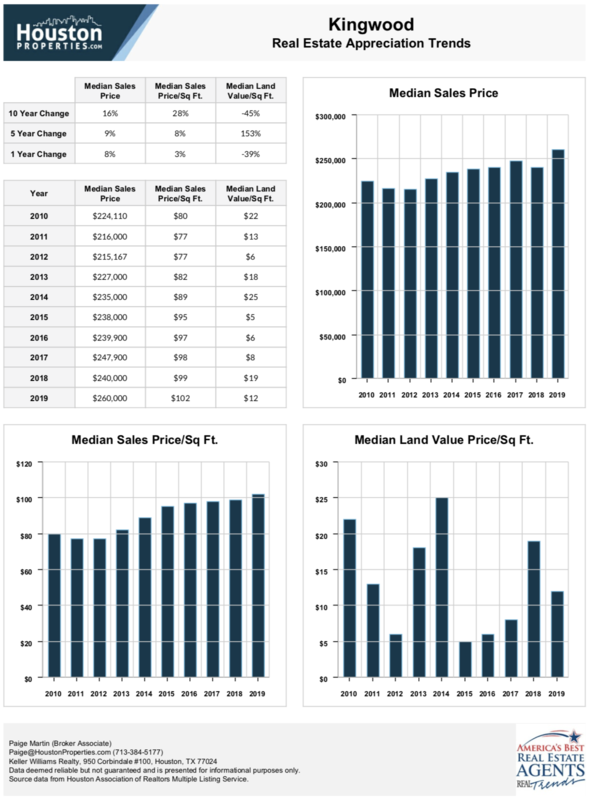 Property values have been steadily increasing, with a median sales price of over $250,000. Many factors contribute to this steady appreciation, including newer construction homes in the area. Older homes tend to fetch lower prices, but updated and new development in the area push median prices up. *Note: Kingwood is made up of several sections, each with its own housing options, styles, and price trends. Looking at each individual village’s data may be more beneficial than looking at Kingwood real estate trends as a whole. For updated information regarding Kingwood real estate pricing and trend analysis, please contact Paige Martin at Paige@HoustonProperties.com. Kingwood offers a great variety of single-family home options. Some sections of the master-planned community offers gorgeous lakefront homes. Others feature homes in golf course communities. Traditional and ranch-style homes are also available in the area. 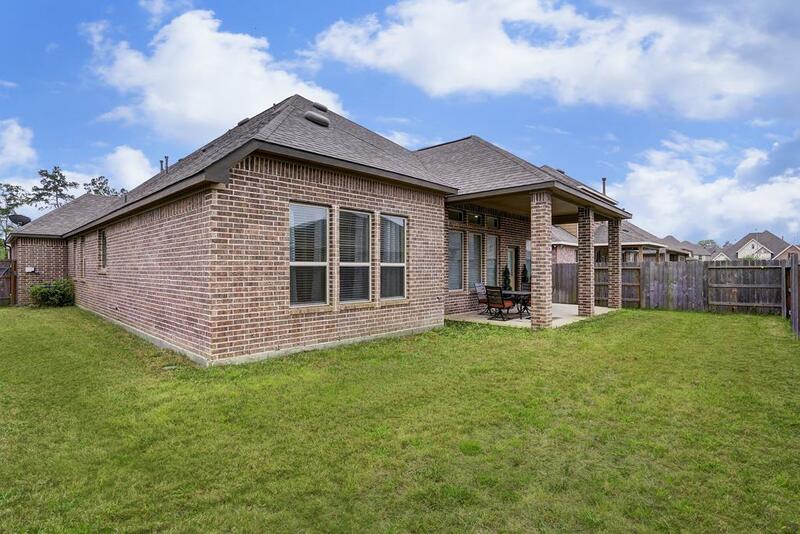 Kingwood real estate typically feature 2- to 4-bedroom floor plans with 2 or more baths. Home sizes vary, but are mostly within 1,000 to more than 3,500 square feet. Homes in the area mostly feature mid- to large-sized lots (by Houston standards), ranging from 3,500 to about 10,000 square feet. Traditional home styles are common in Kingwood, with a few of the community’s older homes showcasing the ranch-style designs. The most expensive Kingwood real estate offer 5- to 6-bedroom options, with 4,000 to 6,500 square feet of living space. Lakefront estates and sprawling mansions sit on sprawling wooded lots, from 12,000 to more than 40,000 square feet. Kingwood Greens Village and Kingwood Lakes mostly feature luxury homes with lake and golf course views. Homes in the area typically sell from $150,000 to more than $800,000, while luxury lakefront Kingwood homes for sale can go for much higher to more than $1,000,000. Some Kingwood villages feature townhomes and patio homes, notably Kingwood Place (the community south of Kingwood Drive, adjacent to Forest Cove and Trailwood Village). Kingwood Glen also features some townhomes. Kingwood townhomes and patio homes are typically smaller, though are more affordable than single-family homes in the area. Townhomes and patio homes in Kingwood can offer 2 to 3 bedrooms spread over 1,000 to more than 1,800 square feet of living space. Two-story floor plans with attached garages are common. Most Kingwood townhomes for sale were built during the 1990s and early 2000s, and feature traditional architectural styles. Lot sizes range from 3,000 to more than 3,600 square feet. Prices for Kingwood townhomes for sale typically range between $130,000 to just under $200,000. Most Kingwood real estate are detached single-family homes and there are very few mid- or high-rise residential condos in the area. In the 1900s up until the 1960s, the area now known as Kingwood was largely undeveloped. It was a sprawling, wooded tract, part of which was owned by the Foster family since the early 1890s. The family operated a lumber company, taking advantage of the area’s lush greenery. In 1967, a joint venture between King Ranch and the Friendswood Development Company sparked development in the area. Kingwood was named for its original developers. The master-planned community was established in 1970, with the first village opening a year later. In 1994, the city of Houston looked to annex Kingwood – a process that took 2 years. Today, Kingwood is a thriving community of more than 60,000 residents. The master-planned community has generally maintained its “close to nature” vibe and suburban atmosphere. Despite its location in the far northwest edge of Houston, Kingwood has plenty of retail, dining, and entertainment options within its borders. The community has an abundance of outdoor entertainment areas like golf courses, parks, and greenbelts. Kingwood homes have easy access to more than 75 miles of hike and bike trails, about 500 acres of parks and nature preserves, and 2 golf courses. One of Houston’s first municipal skate parks, Kingwood Skate Park opened in 2004. It features several picnic benches and tables, a mini-half pipe, kicker rambs, and various rails. Located at 3950 Rustic Woods Drive, the 5,400-square foot park was later renamed Dylan Duncan Memorial Skatepark. Kingwood also has a 2.25-acre dog park. 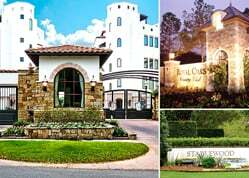 Other points of interest within the community include the Kingwood Cove Golf Club (805 Hamblen Road) and The Clubs of Kingwood (1700 Lake Kingwood Trail). The Clubs of Kingwood plays host to the PGA Tour Qualifiers, both stage I and II. Other tournaments are held in the club as well. Club amenities include 2 golf courses (Kingwood and Deerwood), 26 lighted tennis courts, a water park, a fitness center, dining facilities, and a spa. For retail, residents can visit the Kingwood Town Center, located where Kingwood Drive and Lake Houston Parkway meet. Many of the community’s events are held at the Town Center Park. Deerbrook Mall (in Humble), a 1.2 million square foot mall, is a short drive away from Kingwood.